Bonnie (population 424) is located in south central Illinois (and not over the ocean, or the sea). Illinois Route 37 runs through the center of this south central Jefferson County village. Interstate Highway 57 runs through the west side of Bonnie and Interstate Highway 64 runs about 5 miles north of Bonnie. The town was named for a prominent resident's daughter named Bonnie in 1895. 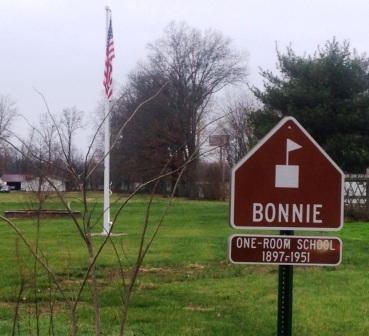 It was not until 1914 that Bonnie was officially incorporated. The Missouri Pacific Railroad cuts through the middle of Bonnie and a small, unnamed creek flows through town as well. 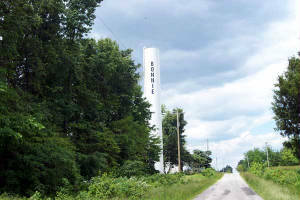 More information about Bonnie can be viewed on the Bonnie web site by going to http://www.villageofbonnie.com/ . "Bonnie High School was a 3 year high school, freshman, sophomore and junior years. After completing all three years, students could attend the high school in the county of their choice to complete their high school education. The four year high schools in Jefferson County were, Waltonville, Woodlawn, Mt. Vernon and Bluford(known now as Webber Twp High School). During the era of the three year high school, the majority of the Bonnie students attended Mt. Vernon; however; those students who preferred a smaller high school than Mt. Vernon chose to attend Waltonville, Woodlawn or Bluford. The state mandated that all 3 year high schools were to close at the end of the 1946-47 school year. The Bonnie School Board of Education contacted Mt. Vernon Twp High School; however, at that time Mt. Vernon Twp High School did not have school buses and would not/could not transport the Bonnie student there. During the early part of August, 1947, just before school started, Elmer D. Murray, Principal of the Goode-Barren Twp High School, Sesser(now known at Sesser/Valier High School), met with the Bonnie Board of Education and agreed to drive to Bonnie to transport the Bonnie students to Sesser. The final decision wasn’t made until about 2 weeks before school started, Fall, 1947. The parents of a small number of Bonnie students wanted their children to go to Mt. Vernon and provided transportation for them to do that. This arrangement continued until Fall, 1950 when Bonnie consolidated with Mt. Vernon Twp High School. I graduated from GBTHS in Sesser. Bonnie Grade School continued to operate until 1967, when the school district merged with Ina Grade School. The Bonnie/Ina Grade School is located in Ina. After the Bonnie grade school closed in the spring 1967, Rend Lake College used the large gym for their Agriculture program and shop until the building was destroyed by a tornado in the middle 1970s. The school building, the gym, a baseball field, parking in front of the building and two outdoor toilets(one for girls and one for boys) were on an area approximately 2 to 3 acres. A local resident bought the salvageable lumber for his use. The space where the school was located has been developed and family homes were built on the property." 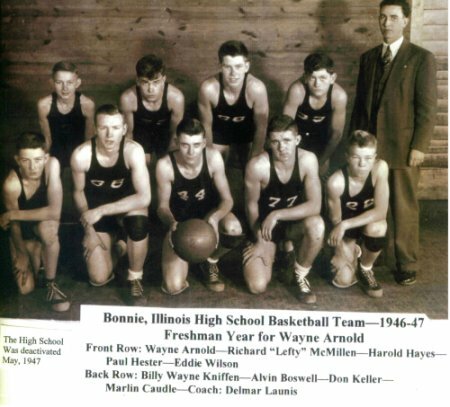 Bonnie High School definitely competed in boys' basketball. It is probable the school also fielded a baseball and track team. If you have any information you can add regarding the Bonnie athletic program please forward the information to us. The Bonnie "boys" won three District Championships during their existence. Two were back-to-back. 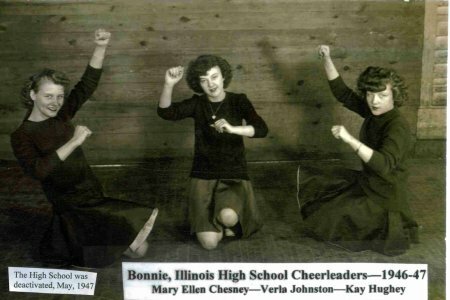 Bonnie High also won a District title in 1945. Unfortunately, coaches names, team records, and great players of these and other Bonnie High School teams are not known. The years of the District Championship teams are listed below. Scores from the IHSA State Tourney involving Bonnie High School which were located on a website titled "Illinois High School Postseason Scores" are also listed below. **Final basketball game for Bonnie High School, consolidated to Mt. Vernon High School in the summer of 1947.